One of the innovative features Victor Hasselblad introduced in his cameras was the interchangeability of all components. As a result, to be able to switch between film types at any given time and without wasting film, you only need an extra film magazine loaded with the required film. No need to carry two cameras, each loaded with a different film, or to remove partially exposed films. The idea, of course, was not new: cameras like the Graflex Victor Hasselblad had used extensively himself also had removable film holders (in fact, they only had removable film holders), offering a chance to switch film type every single shot. To be able to switch film magazines mid-roll, or to have loaded film magazines at the ready, there must be some means of protecting the film against light when the magazine is not on the camera. A thin metal sheet - the dark slide - is used for this purpose. The dark slide is inserted through a slot on one side of the film magazine, covering the film gate entirely. 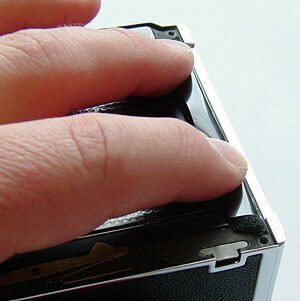 Of course, this opening too must not allow light to enter and reach the film. In Hasselblad film magazines a light trap is positioned on one side of the slot, effectively sealing it both when the dark slide is inserted or removed. The light trap consists of two parts: a foam plastic pad and a folded plastic foil. The foam pad provides the elasticity needed, allowing the dark slide to compress the pad when inserted, and springing back again, sealing the opening completely, when the dark slide is removed. The plastic foil, folded over the foam pad, protects the foam against the sharp edge of the dark slide. The plastic foam material deteriorates over time. It loses elasticity, no longer expanding to seal the slot when the dark slide is removed, starts to crumble, and eventually turns into a sticky goo. This deterioration is caused by the chemical instability of the plastic foam material, and does not depend on use (though it is recommended not to store film magazines with the dark slide inserted, avoiding prolonged compression of the foam pad). As a result, the seal will stop performing its function. 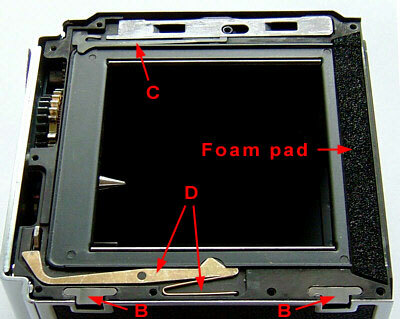 Whether light will then reach the film through the dark slide slot depends not only on the state of the foam pad, but also on the outside light level, and the position of the slot relative to the source of light. Light leaks are a chance occurance when the seal begins to break, though over time they can, and will, become more frequent. 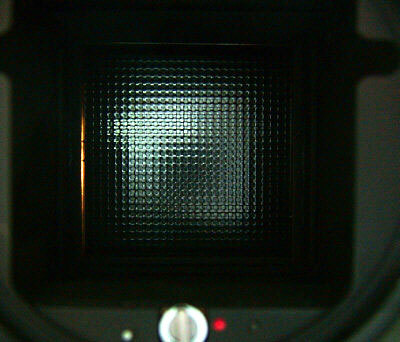 The effects of a defective seal always show up predominantly on the left side of an image, even though light is entering the magazine at the image's right hand side (the dark slide slot through which light is coming in is on the left side of the camera too, but remember that images are reversed on film). Light entering through the slot however cannot reach the film immediately - the film plane is recessed - but is first reflected off the film gate's border opposite the dark slide slot. The image on the left shows a view through the front of a 501 CM, with the lens removed, the auxillary shutter opened, and the dark slide withdrawn. The 'waffle' pattern visible is the magazine's pressure plate. A light is pointed at the dark slide slot, and as is clearly visible, is reflected off the opposite edge. Clearly visible too are the two Hasselblad "V"-notches. How long it takes for a foam pad to disintegrate enough to have light leaks occur is difficult to say. It is however certain that light traps will have to be replaced sooner or later. Leaks will, of course, ruin exposed frames. That can be no more than an slight annoyance, but for professional photographers may also lead to significant financial damage, loss of good-will and of reputation. 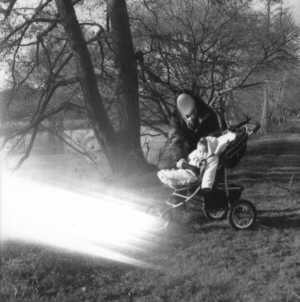 It is therefore highly recommended to change the light traps regularly, before light leaks occur. How often that should be is difficult to say, but changing a magazine's light trap once every year, once every two years at most, should safely prevent leaks. When changing light traps, it is not always necessary to replace both parts. The foam pad is the critical part, and will need replacing. The plastic foil however only needs to be replaced if it shows cracks, tears or other obvious signs of heavy wear. Changing the seal is a simple procedure, and the only tool required is a small screwdriver. After removing the dark slide, the first thing to do is remove the screws holding the magazine's front plate. Note that in older magazines one screw - bottom left (A) - is slightly longer than the rest. With the front plate removed, the seal is visible on the right hand side (the photo only shows the foam pad in its place). Some other parts are now visible too that need our attention while the front plate is off. Below the film gate is a pivoted arm (D). 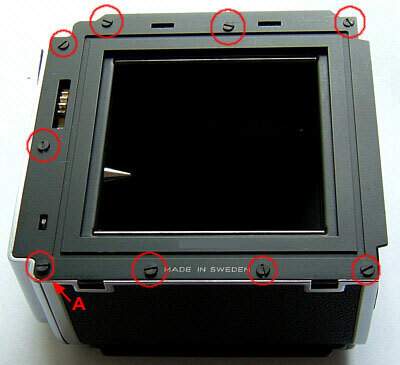 When the dark slide is inserted, it pushes the triangular lip on the right hand arm of the rocker down, moving the left arm up into the opening in the magazine (above the lower left hand corner screw), blocking the shutter release. A wire spring (D) below the right hand arm raises it again when the dark slide is removed. Along the bottom edge of the magazine are the two openings that mount over the lugs on the camera's rear. 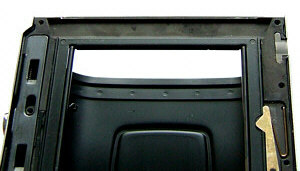 Thin metal foil blade springs (B) over these openings help adjust the correct lens seat to film plane distance. Make sure none of these parts are dislodged or fall out. Above the filmgate is the arm (C) that blocks the film magazine's release button when the dark slide is not inserted. Make sure that this part too is not dislodged. Remove the two parts of the old seal completely. Discard the foam pad, and inspect the foil. When damaged, it will need replacing. If not, it can be reused. Put the foil in place. The longer part with beveled ends fits into the recess in the magazine. The straight ended part is on the far side of the film gate. Put the foam pad in the recess, on top of the foil. Make sure that the side backed with a metalic foil is down. Fold the foil over the foam pad. Put the magazine's front plate back in its position, and insert and tighten the screws. The part of the foil folded over the pad will spring back up when you remove your fingers, making it difficult to keep it in its proper position while replacing the front plate. It can be held down using the dark slide, which is of course thin enough to allow the front plate to be seated with the slide keeping the foil in place. Paillard's instructions below illustrate how to use the slide. Paillard Incorporated distributed Hasselblad products in the U.S.A. 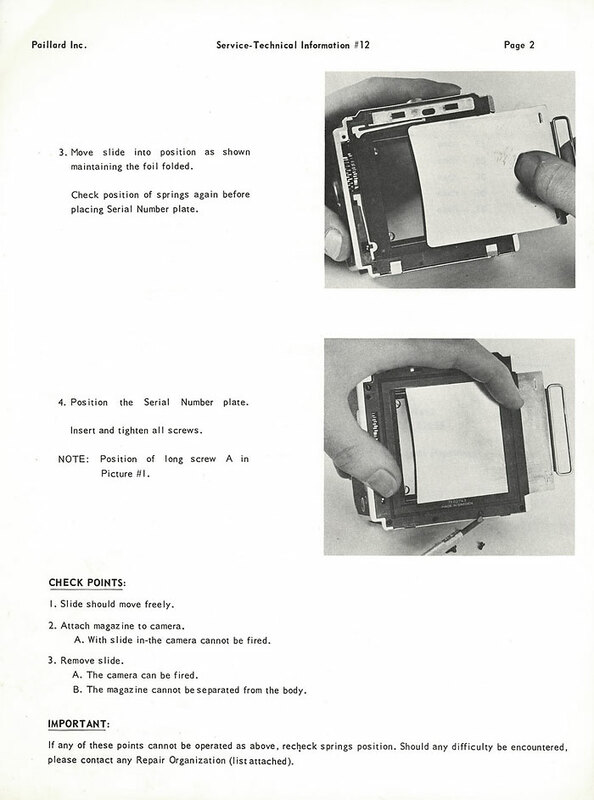 The company also serviced Hasselblad equipment, and produced a number of instruction sheets. Below is Service-Technical Information no. 12, providing instructions to change light traps on Hasselblad magazines. 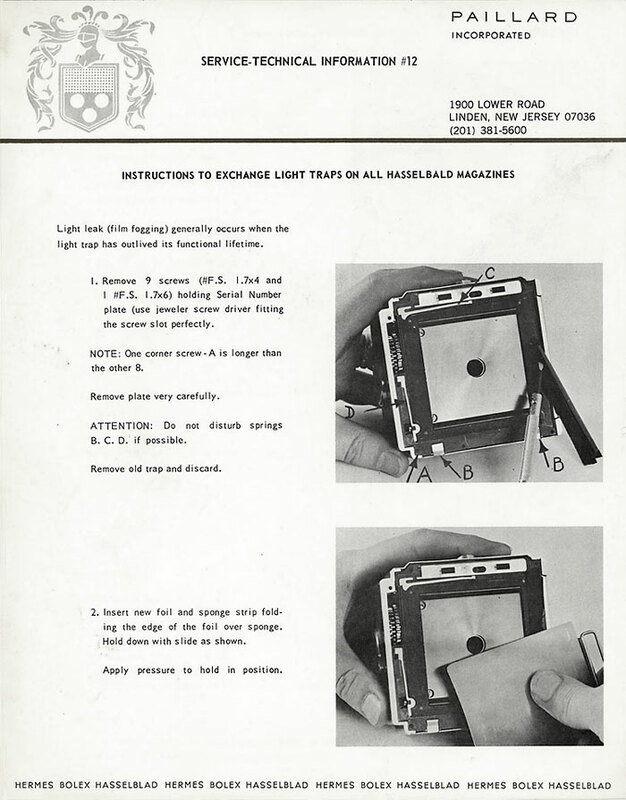 Though both the light trap and how to change it has remained unchanged since the time this sheet was produced, a few upgrades of the magazine's construction are notable. The one that is immediately obvious is the large 'peep hole' going through the pressure plate to allow visible inspection of the frame numbers printed on the film's paper backing. Less obvious perhaps is the change made to the mechanism that blocks the camera's shutter release when a dark slide is inserted. Spring "D" in Paillard's first photo, when pushed by the dark slide, covers the opening above the lower left hand corner screw. The dark slide will only reach spring "D" when it is almost fully inserted. This also means that to lift the block, the dark slide only needs to be drawn a very small way. As a result it is very easy to release the camera without noticing that the dark slide has not been drawn and is still covering the film. In later versions, spring "D" has been changed to the form visible in the photos above, with a sprung arm blocking the release and lifting the block again when the dark slide is inserted or drawn half way respectively. 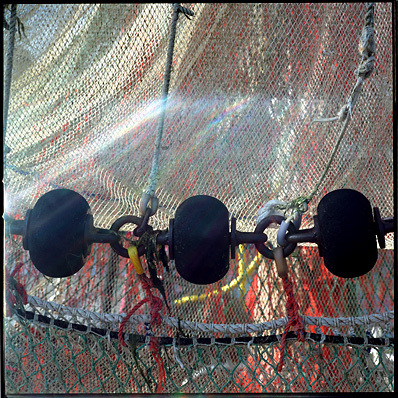 Copyright 2004, 2007 - Q.G. de Bakker and Stefan Heymann. All rights reserved.